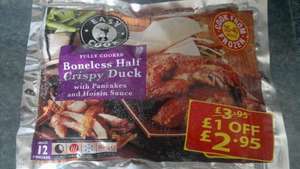 Farmfoods have £1 off their easy cook boneless half crispy duck - making them £2.95! These come with 12 pancakes and hoisin sauce - delicious. You'd be quackers to miss it..
How do you make the duck sing? Put it in the oven till it's Bill Withers. Aside from the jokes can anyone confirm these are any good? Don't want to run the risk of being seen in farm foods if they are not even tasty. They're quite good, have had them a few times. Aside from the jokes can anyone confirm these are any good? Don't want to … Aside from the jokes can anyone confirm these are any good? Don't want to run the risk of being seen in farm foods if they are not even tasty. They are just as good as any other frozen crispy duck I've had..
You've convinced me. Will try a pack later. Thing is though I have noticed a distinct difference in the clientele between home bargains and farm foods. Should be ok if I go after work, will ditch my shirt and trousers and chuck on an old hoodie with some trainers. Thanks for the heads up. ...will ditch my shirt and trousers and chuck on an old hoodie with some … ...will ditch my shirt and trousers and chuck on an old hoodie with some trainers. You really should wear your slippers. It's de rigueur in Farm Foods. You've convinced me. Will try a pack later. Thing is though I have … You've convinced me. Will try a pack later. Thing is though I have noticed a distinct difference in the clientele between home bargains and farm foods. Should be ok if I go after work, will ditch my shirt and trousers and chuck on an old hoodie with some trainers. Thanks for the heads up. Jesus! You're buying food, not socialising with the people who shop there. There's nothing wrong with Farmfoods, unless you're a stuck-up snob who doesn't like to be seen a store that middle class people shop in. Guess some people just can't take a yolk. I've never been in a Farmfoods but from the outside I always get the impression that most of the food has never been near a farm in its life. I suppose you were being sarcastic here then? I'm dressing up in a Tuxedo to go shopping in Marks & Spencer later! I was yes, bit of light hearted humour. I will be getting a couple of packs seeing the heat this has reached. I've never been in a Farmfoods but from the outside I always get the … I've never been in a Farmfoods but from the outside I always get the impression that most of the food has never been near a farm in its life. If anybody asked me about a farm foods shop, my first thought would be it must be a place for food that is used on farms. I'll see your sarcasm and raise you some more sarcasm ;)I'm dressing up … I'll see your sarcasm and raise you some more sarcasm ;)I'm dressing up in a Tuxedo to go shopping in Marks & Spencer later! Cold. Who on earth shops there? Just tuckin the blade in the trackies then I'm off. Wish me luck. Jesus! You're buying food, not socialising with the people who shop … Jesus! You're buying food, not socialising with the people who shop there.There's nothing wrong with Farmfoods, unless you're a stuck-up snob who doesn't like to be seen a store that middle class people shop in. What has Jesus got to do with it? Remember people, you have to venture into the depths of scummy Farmfoods and mingle with rubbish people in order to buy these!!! Also, if you consider the source, they'll be crap!! Two serious negatives for me, I'll give them a miss. You actually get 8 pints of milk for £1.50; they charge £1 for a 4 pint bottle or £1.50 for 2x 4 pints.. I have no loyalty to any specific store, regularly shopping in farmfoods, aldi (their breakfast waffles are the only ones my daughter will eat), asda, tesco, morrisons & M&S, and I can honestly say that the staff in asda and farmfoods are by far the most friendly. Remember people, you have to venture into the depths of scummy Farmfoods … Remember people, you have to venture into the depths of scummy Farmfoods and mingle with rubbish people in order to buy these!!! This isn't strictly true; in my local farmfoods, the ducks are in the first aisle, so you could easily get away with a slight sojourn rather that a venture to the depths..
haha love all these comments, im 22 never been in a Farmfoods. It just looks horrible, same as Iceland which I dont mind as they have nice sweets and always have a good deal on the 3 litre bottles of coke, but I still prefer not to go to in there. I get the same feeling when I walk past iceland as I do with farmfoods, just glance into it and see all the chavvy 18 year olds and all the inbred thick sounding people. Asda is right by farmfoods/iceland where I live and its pretty much the same price for better produce. I went into iceland about january time to get some cans as I was working nearby. Few people in front of me, one a smackhead looking character with fresh blood on his head, 3 young girls/guy being irritating with a trolly full of frozen chicken and looking like they were smacked out of their skull and the lady on the till who had no manners and pretty much stared through me ( she also looked like a typical south wales valley inbred ) needless to say I aint been back since, if I do I might have a few to many heroin addicts to push out the way. People who have to feed a family well on a limited budget! Why do people care who shops where they do, how sad have you got to be to base your shopping choices on who goes there, ridculous. Are they 2 for £5 as well? The in-laws had them on Friday - said they were as good as any they've had from a take away. They aren't easily impressed so I can say, without fear of contradiction, that these should be pretty good. Cans of what? Tennants Super is it, hard lad? Being serious Farmfoods is great for certain things. Much cheaper than Asda Tesco etc. I just went to Tesco and bought 2 Dr Oeker Pizzas for £4. I then went to Farmfoods for the Duck. The Dr Oeker there were 2 for £3 so I bought them and took the others back to Tesco. There are many things in there that are a good bit cheaper. Milk as mentioned above. Ice Cream products are good. The Nicky Kitchen roll is cheap and as good if not better than the dearer stuff from the Supermarkets. Soft drinks are another money saver. Anyone with a brain, I dont know any other place where you can you buy 2 Hovis sliced loaves for £1.00,, grant you not everything they sell is brilliant but amongst it there are some excellent value products. We tried the packs of sirloin, it was pretty poor, just about edible.We have also tried quite a few other products which have been fine. The duck is a good price and I for one will be buying some. Why would you by a pizza made by a doctor? I wouldn't go to a chef if I was feeling ill.
Why would you by a pizza made by a doctor? I wouldn't go to a chef if I … Why would you by a pizza made by a doctor? I wouldn't go to a chef if I was feeling ill.
Why wouldn't you buy one made by a doctor? It's only a pizza. It doesn't require a brain surgeon to put one together, but it can't do any harm!